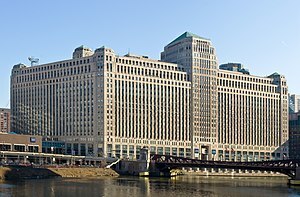 Merchandise Mart, Chicago, Illinois. Designed by Graham, Anderson, Probst & White, constructed 1928–1930. May’s Puzzler dealt with the size of Willis Tower , formerly Sears Tower, and its size in terms of square feet: 3.8 million sq. ft.
What is another building in Chicago to have in the neighborhood of 3.8 million square Feet? If you said the Merchandise Mart you win! The Mart encompasses 4 million square feet and was the world’s largest until the Pentagon was built. The Pentagon has 6.6 million sq. ft. but is now only the seventh largest building, and the Mart isn’t even on the top twenty list. Some of you weren’t too confident in your answer, and even one or two thought I might be trying to trick you. Perish the thought! One person hedged their bets and also offered the old Chicago Post Office Building (now closed) as a guess. You got me thinking, so I looked it up. But it’s just a piker compared to the Mart with just 2.6 million square feet. Thanks to all who sent in your answers. Special thanks to Mary Gerding for suggesting this Puzzler question. Keep ’em coming, Mary. And if anyone out there has a good puzzler question to offer, please do. This entry was posted on Sunday, May 20th, 2012 at 8:36 pm	and tagged with Chicago, Demographics of Chicago, Michigan Avenue, Pentagon, Puzzler, Recreation, Tour guide, United States, Willis Tower and posted in Uncategorized. You can follow any responses to this entry through the RSS 2.0 feed.